In terms of oil reserves, the Middle East is second to none. This “oil miracle” of the world has been shaped by a set of favorable factors, some global and others local, inscribed in the geologic history of the region. Part One of a two part series by author Rasoul Sorkhabi, focussing on oil and gas in the Middle East. Part Two - How Much Oil in the Middle East? 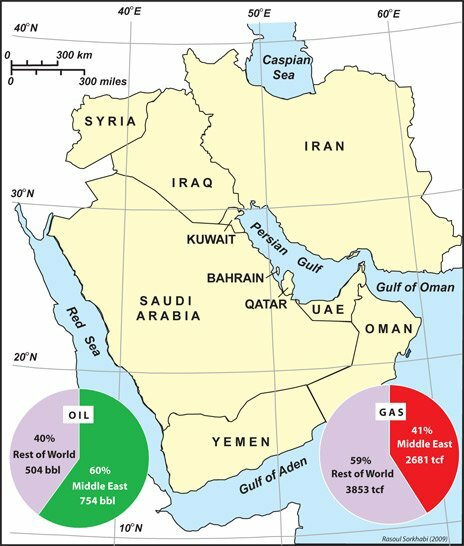 Ten countries in the Middle East account for only 3.4% of the area but contain 48% of world’s known oil reserves and 38% of natural gas reserves. Despite decades of exploration worldwide, we have not found ‘another Middle East.’ Source: Rasoul Sorkhabi The term ‘Middle East’ is not without problems. First, it has colonial connotations, as the phrase first appeared in the mid-nineteenth century as part of the Europe-centred division of the East into the Near, Middle and Far East. Second, there is no consensus on the geographical extent of the Middle East. Some define it as the region between India and Egypt, in which case it has been aptly designated by the United Nations as Western Asia. Other definitions also add North Africa or central Asia. For the purpose of this article, the term ‘Middle East’ focuses on the oil-rich countries in south-west Asia including Iran, Iraq, Syria, Kuwait, Saudi Arabia, Bahrain, Qatar, United Arab Emirates (UAE), Oman, and Yemen. These ten countries together have an area of 5.1 million square kilometres, or about 3.4% of the Earth’s land surface, but they possess according to BP’s 2012 Statistical Review of World Energy, 48% of world’s known oil reserves and 38% of natural gas reserves. From time to time, regions such as the Caspian or West Africa have been fantasised as ‘another Middle East’ but none has materialised, which begs this important question: why is there so much oil in the Middle East? This article synthesises our knowledge about this question and briefly describes the geological factors for the abundance of oil in the Middle East. 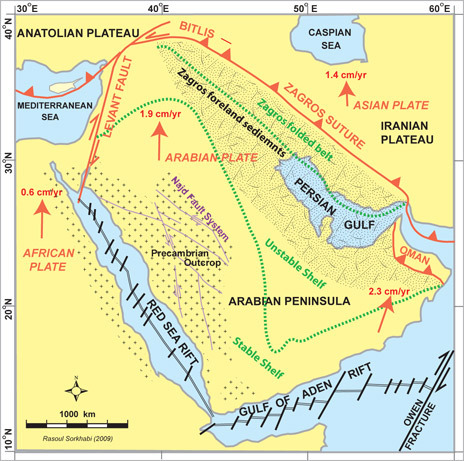 The tectonic framework of the Middle East is divided into (1) Zagros fold-and-thrust belt, (2) Unstable Arabian shelf, and (3) Stable Arabian shelf. The Arabian continental plate, which collided with the Asian plate along the Bitlis-Zagros suture during the Eocene, is still converging with Asia at a rate of 1.9 to 2.3 cm per year based on GPS measurements. (Global measurements of relative plate motions of Arabia with respect to Eurasia show higher velocities of 2.4-3.5 cm per year). This continental collision gave rise to the Zagros orogen and its Cenozoic foreland basin, which was superimposed on the Paleozoic-Mesozoic Tethys shelf basin. The cumulative thickness of sediments in the region reaches up to 12 km. 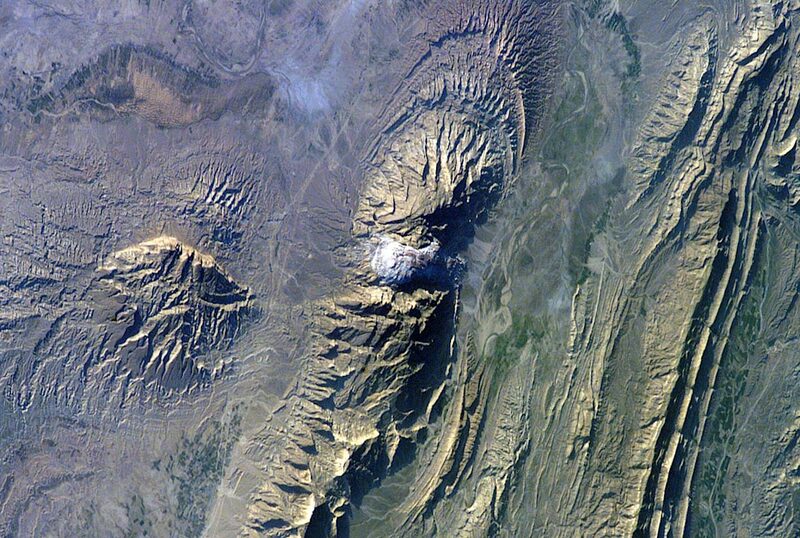 The Zagros deformation and salt domes have folded the sedimentary beds into large, gentle anticlines (‘whaleback’ structural traps). The western and southern boundaries of the Arabian plate are bounded respectively by the Red Sea and Gulf of Aden rifts. These Neogene continental rifts have separated Arabia from Africa, and are further pushing Arabia against Asia. The rift-shoulder uplifts have outcropped the Precambrian rocks (part of the Nubian-Arabian shield) along the Red Sea and are capped at places by rift-related volcanic rocks. The Proterozoic-Cambrian transition at about 542 Ma opened a new chapter in the geologic history of the Middle East with far-reaching implications for petroleum resources of this region. After a long history of ocean subduction and micro-continental collision along the north-eastern margin of Africa from about 700 Ma to 600 Ma, the basement rock of the Middle East (the Nubian-Arabian shield) was consolidated. This event, together with some other collisions, assembled the supercontinent of Gondwana in the southern hemisphere, comprising Africa, India, Australia, Antarctica, and South America. At this time the Middle East was positioned on the north-facing passive margin of Gondwana. Throughout Paleozoic and Mesozoic times, the Middle East was a locus of sedimentation over a long and wide shelf affected, from time to time, by sea level changes. As Gondwana consolidated at the turn of the Cambrian, microorganisms and marine species also rapidly evolved and diversified, thus enriching marine sediments with organic carbon necessary for hydrocarbon generation. The Tethys Ocean, which washed the northern margin of Gondwana, was not a single ocean, but developed in at least three oceanic basins: Proto-Tethys (Infracambrian-Carboniferous), Paleo-Tethys (Ordovician-Jurassic), and Neo-Tethys (Permian-Paleocene). This sequential development of Tethys took place as continental fragments successively broke away from the Gondwana margin and drifted northward to join the paleo-Asian continent. The opening of each Tethys ocean was accompanied by extensional tectonics which, in turn, created continental rifts during the Infracambrian (Ediacaran-Cambrian transition period), the Ordovician, and the Permian in the Middle East. These rift basins added favourable sites for petroleum generation in the region. 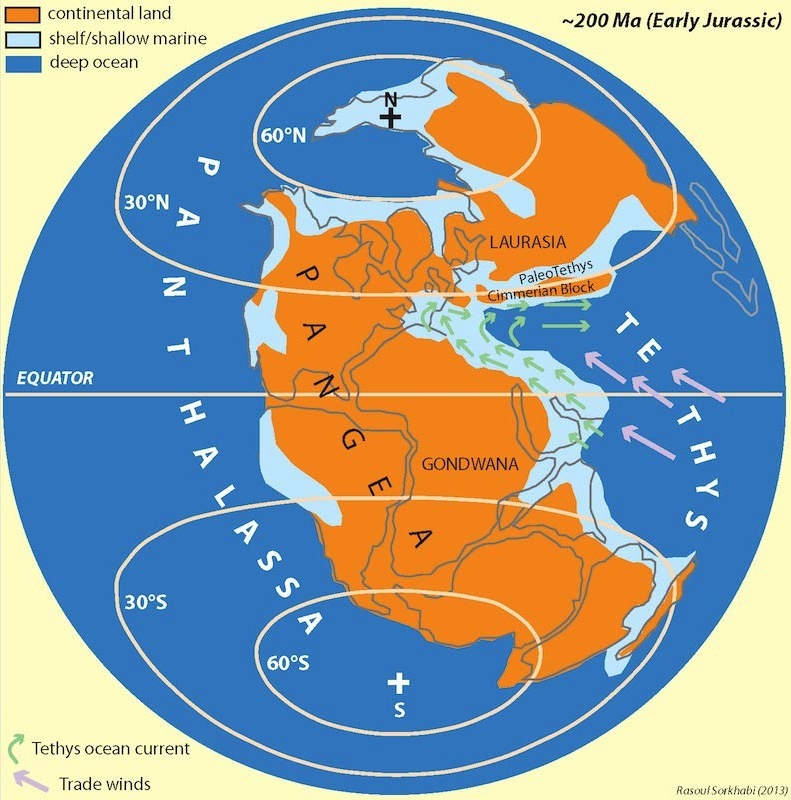 At the end of the Palaeozoic, Gondwana merged with Laurasia to form the largest supercontinent ever, Pangea. It was also during this time that Proto-Tethys closed and Neo-Tethys began opening. In the Late Cretaceous, Neo-Tethys began to subduct beneath the southern margin of paleo-Asia (along the Anatolia-Iran-Tibet margin) and shrank in size until the ocean completely disappeared in the Eocene and gave way to a foreland basin in front of the rising Bitlis-Zagros-Himalayan mountains. 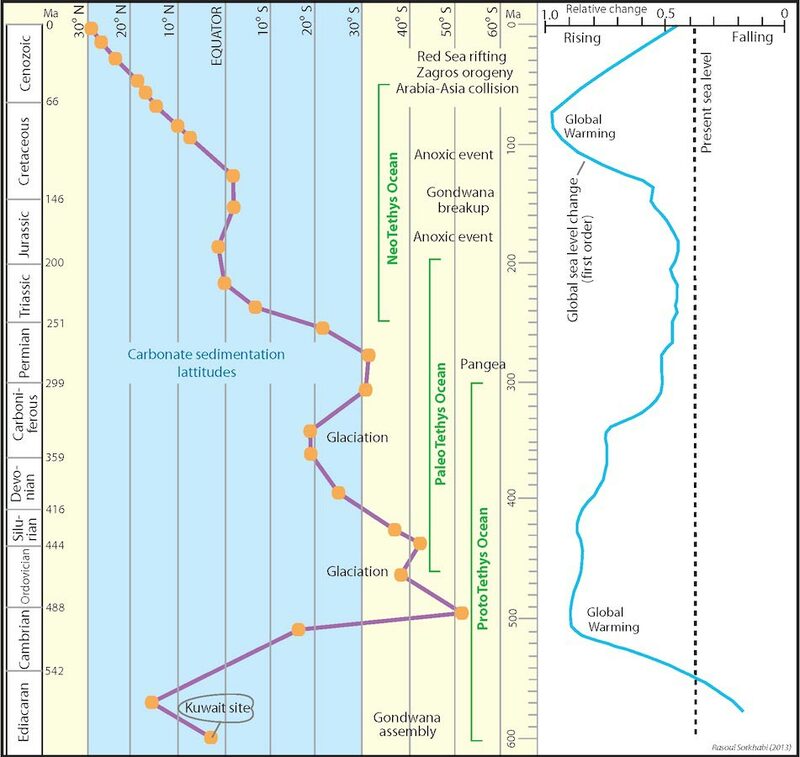 the Cenozoic foreland sequence including both carbonates and siliciclasitcs (toward the top) and with early Paleocene and Oligocene hiatuses in some areas. This tectonic-sedimentation framework impacted on petroleum generation and accumulation in the Middle East in ways unique to this region. Movement of the Kuwait-Persian Gulf area throughout Phanerozoic times. Also shown are major geologic events relevant for sedimentation history of the region. Compiled from various sources including Beydoun (Episodes, June 1998). Organic-rich source rocks (with total organic carbon >5%) are not unique to the Middle East. What is remarkable about the Middle East’s source rocks, though, is that they were deposited on a passive continental-shelf margin spanning Palaeozoic and Mesozoic times in relatively stable conditions, which took advantage of sea-level rises, anoxic (reducing) environments, and nutrient-rich upwelling sites off the coasts. Moreover, these marine shales and marls contained oil-prone kerogen types I (protein/lipid-rich algal organic matter) and II (lipid-rich but with lower hydrogen-to-carbon ratios). One of the lucky horizons for petroleum generation in the Middle East is the Silurian ‘hot’ shale, called the Qusaibah Shale in Saudi Arabia but also found in some other parts of the Middle East and North Africa. Paleogeographic modeling of Paleozoic continents and atmospheric circulations (Judith Parrish, AAPG Bulletin, June 1982) shows that during the Silurian the Middle East was close to a major upwelling current that enriched the sediments with exceptional amounts of organic matter. However, over 70% of the Middle East oil was generated from Jurassic-Cretaceous sediments (accounting for less than 30% of the Phanerozoic eon). Some of these classic source rocks include the Sargelu Formation (Middle Jurassic, 150-200m thick in type locality), Garau Formation (Lower Cretaceous, over 800m thick), Gadvan Formation (Lower Cretaceous, 100m thick), and Kazhdomi Formation (Middle Cretaceous, 200m thick) in the Zagros Basin of south-west Iran, and age-equivalent limey-shale formations in Iraq and the Persian Gulf areas. World paleogeography in the Early Jurassic (~200 Ma) when the Middle East was part of Gondwana passive margin and was submerged under the warm equatorial waters of Neo-Tethys. The triangular Neo-Tethys Ocean had a wide and long shelf, restricted on the western end but open to the east. The idea of trade winds and Neo-Tethys ocean currents (concentrating nutrients for planktons) comes from Irving et al. (Canadian Journal of Earth Science, Jan. 1974). These conditions, which favoured the eposition of organic-rich source rocks and thick carbonates, prevailed in the Middle East until the latest Cretaceous. In Late Jurassic-Early Cretaceous times, Gondwana was split apart, and as rift volcanism and sea-floor spreading developed, ocean temperatures rose and ocean waters were enriched with nutrient elements from volcanic outpourings (along mid-ocean ridges and continental margins or island arcs). Oxygen-isotope analyses of marine limestones have shown that 125-85 Ma was a time of severe global warming due to a rapid increase in atmospheric carbon dioxide concentrations (mainly from increased volcanic activities). This is consistent with sequence stratigraphic evidence for sea-level maxima in mid-late Cretaceous times. Warm climate, high-stand seas and increases in the nitrogen-phosphorus-carbon contents of oceans, in turn, led to a profuse radiation of plankton populations - a key factor in the organic richness of marine sediments laid down during that period. Neo-Tethys most benefited from these events and the Middle East was in the right position at the right time. 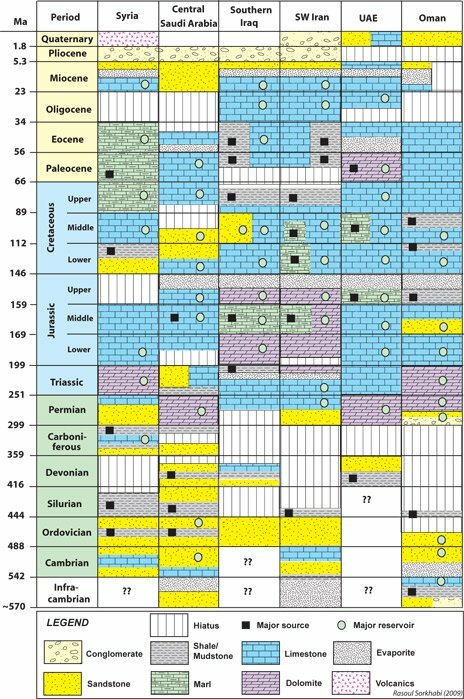 Based on their sedimentary facies distributions, R. J. Murris has divided the Mesozoic carbonates of the Middle East into two categories. The first one is carbonate ramps (mixed with clastic clayey beds), with cycles (‘layer cakes’) ranging in thickness from 30 to 100m and deposited during marine regressions when clastics were brought into the basin. The second category is differentiated carbonate shelf or platform carbonates, which were deposited under transgressive conditions, where differentiation is marked with starved (sediment-deficient) euxinic basins separated by high-energy margins from carbonate-evaporite platforms. Rich source rocks are included in the second category. Stratigraphy and petroleum source-reservoir rocks of selected areas in the Middle East. Data compiled mainly from Beydoun (1999) and Alsharhan & Nairn (2003). Illustration by Rasoul Sorkhabi The Middle East is renowned for its rich carbonate oil reservoirs. Such reservoir rocks are also found in North America and Western Siberia (mainly Palaeozoic), Central and South America (mainly Mesozoic), and South East Asia (mainly Miocene). In the Middle East, however, carbonates were deposited on a long and wide shelf from the Permian to the Paleocene with insignificant hiatus. Even after the Arabia-Asia collision, carbonate sedimentation continued in a very shallow marine environment (an ongoing process in the Persian Gulf). Indeed, large oil fields in the Middle East have thick stacks of multiple carbonate payzones. Limestone and dolomite reservoirs of the Middle East have fairly good porosity and permeability. Primary porosity has been well preserved in packstones and grainstones such as those of the Late Jurassic Arab Formation widely spread in the Middle East. 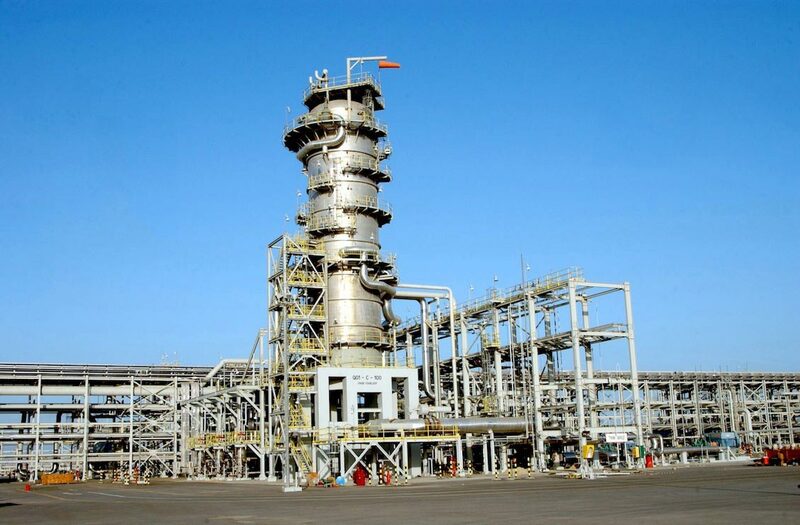 In Saudi Arabia’s Ghawar field (the world’s largest oil field), two producing members (C and D) of the Arab Formation, have thicknesses of 30m and 80m respectively, and a porosity of 20%. The same formation in the UAE ranges from 130 to 240m in thickness and 10-30% in porosity. Moreover, the Zagros deformation has created fracture networks enhancing permeability, especially in cemented limestones such as the Oligocene-Miocene limestones of south-west Iran (Asmari Formation) and eastern Iraq (Jerribe Formation), where their thicknesses range from 120-480m, and porosities from 8-24%. and the Miocene Gachsaran Formation. In this manner, the entire Phanerozoic succession is bounded by evaporite seals both at the bottom and on the top. These ductile evaporite and shale beds have also acted as detachment horizons for the Zagros thrust structures, thus producing vertical compartments of petroleum systems within the sedimentary succession. Basin modeling of various fields of the Middle East has shown that the Jurassic-Cretaceous source rocks were buried to oil-generation temperatures during the Neogene, and that the oil window partly overlapped in time with Zagros deformation and the development of large anticlines as structural traps. In fact, in the Zagros Mountains Precambrian metamorphic rocks do not outcrop, and those metamorphic schists and granites in Zagros which were once thought to be of Precambrian age, have been dated as Paleozoic by high-resolution radiometric methods. Note that a thin-skinned deformation in the Zagros fold-and-thrust does not overrule the possibility of basement deformation at deeper levels; it simply means that deformation of the sedimentary cover has been decoupled from that of the basement (of which we have little knowledge). Perhaps, millions of years in the future, Zagros will also look much like today’s Himalayas, especially if the motion of the Arabian Plate, currently being pushed by the Red Sea rifting, becomes faster as the Red Sea develops into a wide ocean. The Infracambrian Hormuz salt has also created salt diapris and folds, which provide favorable structural traps for oil; these salt movements date back to the Late Cretaceous. Although the Hormuz salt has been mapped only in some areas of the Middle East, its true extent is not precisely known as it has not been drilled in areas such as southern Iraq or the UAE. For petroleum to be successfully generated, migrated, accumulated, and preserved, all elements and processes of the petroleum system, including organically rich and thermally matured source rocks, porous-permeable reservoir rocks, effective extensive cap rocks, and appropriate time relations between oil migration and trap formation should be present. Obviously, the Middle East qualifies all these conditions to a high degree and quality. Large ‘whaleback’ anticlines generated by the ‘gentle’ Zagros compression (folding and thrusting) or salt diapirs provided abundant structural traps for oil accumulations. Since the 1950s a number of petroleum geologists working in the Middle East have opined on the richness of oil in that region; classic papers published in the AAPG Bulletin include Baker and Henson (October 1952); Law (January 1957); Kamen-Kaye (December 1970); Murris (May 1980); Bois et al. (September 1982); and Klemme & Ulmishek (December 1991). The Late Z. R. Beydoun also discussed an issue in Episodes, June 1998. Habitat of Oil, edited by Lewis Weeks (1958) is the proceedings volume of an AAPG symposium on this topic, which also includes several classic papers relevant to the Middle East. I have benefited from all these sources. How Much Oil in the Middle East? Central Asia represents an exciting frontier for oil exploration, from sub-salt to sub-thrust exploration. 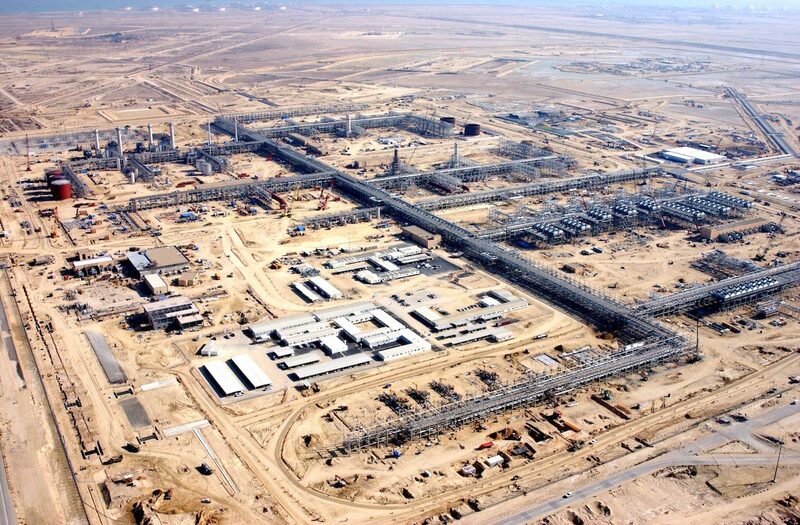 The region remains a hive of activity, boasting some of the largest oil and gas fields in the world, including Yolotan (Turkmenistan), Gazli (Uzbekistan) and Karachaganak (Kazakhstan). The implementation of new technology has revealed significant new potential in the Amu-Darya, Ustyurt and Afghan- Tajik Basins.